Hitec isn’t a name that generally pops up in conversations about surface radio gear, and that’s because they haven’t put any new radios out in a while. I actually used to race with an older Hitec CRX Aggressor radio which was as reliable as they come and customer service was top notch. Needless to say, I was super excited to see Hitec is getting back into the radio game with a brand new 2.4GHz, 4-channel radio setup and I jumped at the chance to review the Lynx 4S radio. 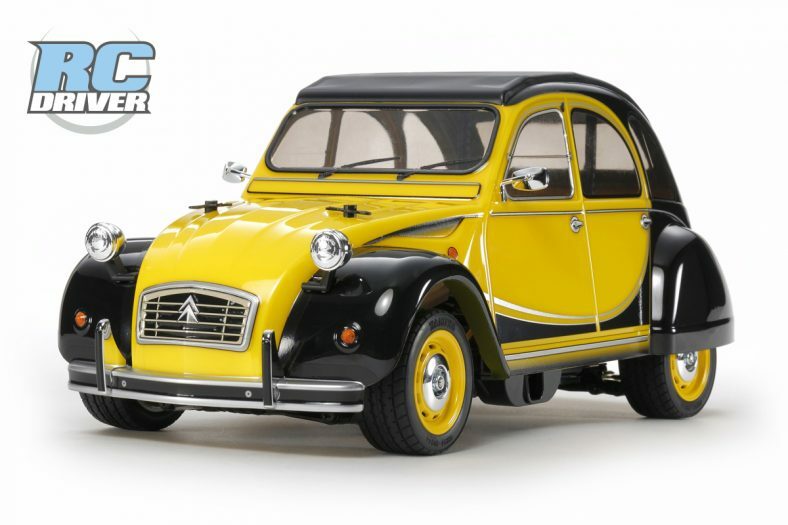 You get plenty of high end features with telemetry, adjustable steering positions and it can even play some of your favorite tunes from a micro SD card. If you don’t have a 4-channel radio yet or are looking to upgrade check out the Hitec Lynx 4S system, it has every- thing you want and more. particular tasks. 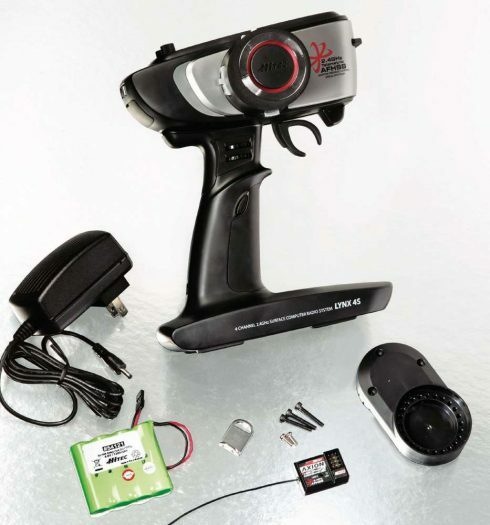 For racing, the Axion 2 receiver is your best bet as it employs Hitec’s HHR system (Hitec High Response) with just a 4ms response rate, making for lightning-fast servo responses. Keep in mind that this receiver can only be used with digital servos and will damage analog components. It will only use two channels for greater performance. 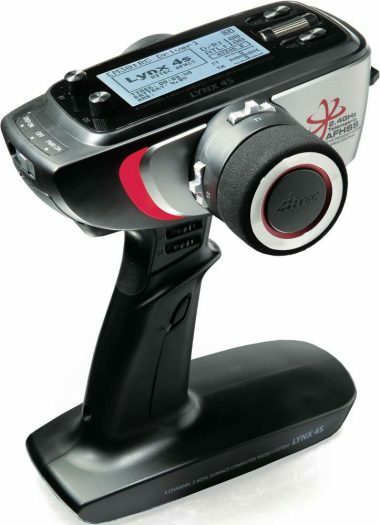 For general purpose applications, there is the Axion 4, a 4-channel setup that utilizes every channel the Lynx 4S radio can transmit and has options for 7ms and 14ms frame rates depending whether you have digital servos or not (selectable within the transmitter itself). Lastly, the Proton 4 receiver is geared to take advantage of all the telemetry options the Lynx has to offer. It has a built- in GPS sensor so right off the bat you will get speed measurements without any modules. 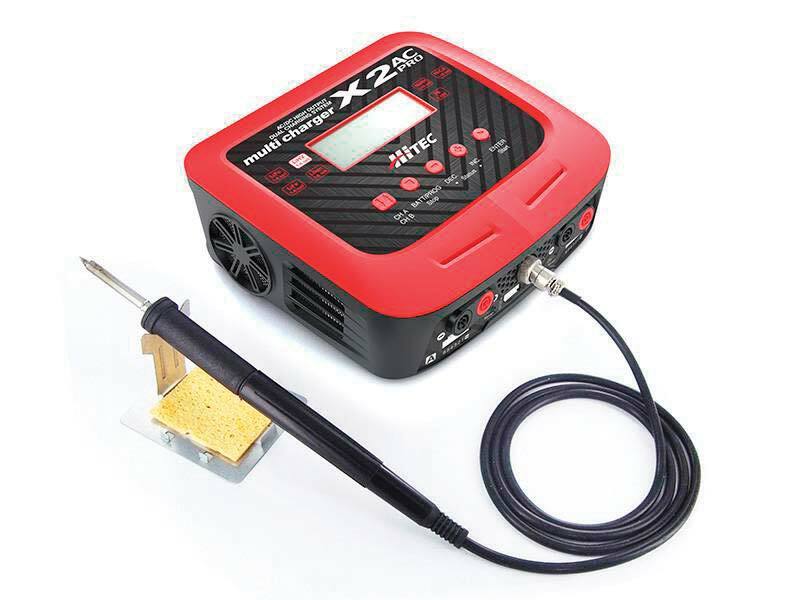 It has ports for temperature and RPM sensors as well and is capable of detecting the receiver voltage at all times. What is great is that these receivers have extra ports for plugging in fans or external battery sources if desired. The display is very bright and easy to read. It is backlit and its intensity can be adjusted within the menus. I prefer the max setting, but maybe in dim lighting a lower setting would be desired (this probably helps increase battery life as well). The only thing that took some getting used to was that the display is not read in the orientation you hold the transmitter. That means you have to turn the Lynx 4S sideways to get through the menus and make adjustments. This takes some getting used to, but is not a deal breaker by any means. The LCD quality is good but simple; it has no problem in getting any information to the user in a clear, uncluttered fashion. If you wish, the display can be turned on without transmitting a signal. This can be useful for setting up various parameters that do not need the model to be active. 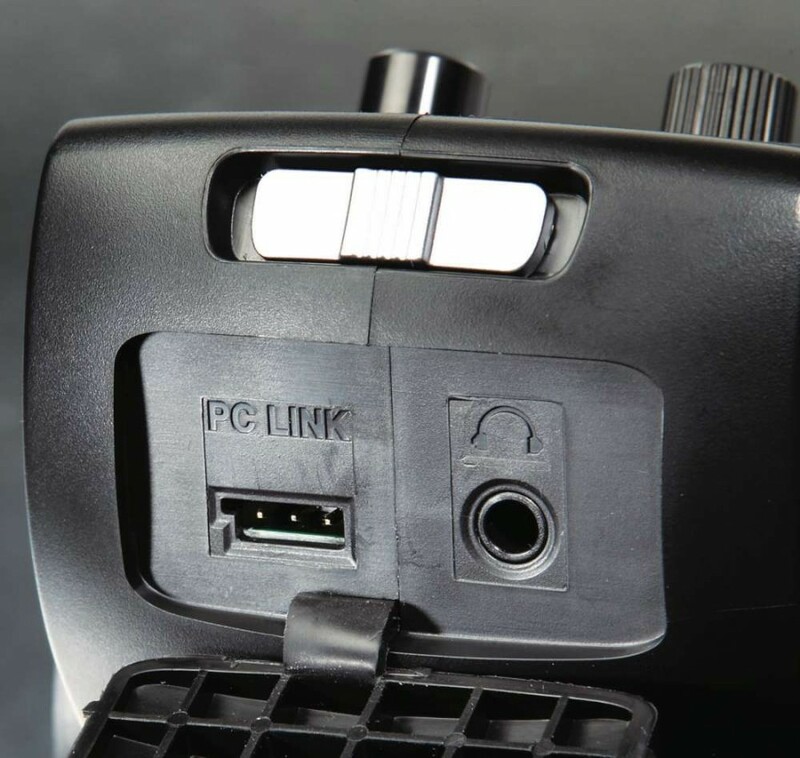 The Lynx offers a plethora of mechanical adjustments to keep every driver happy. You can very easily switch the steering wheel from the right to left side and also up and down to suit the user’s personal preference. It is pretty simple also. Pop off the back plate and unscrew a few hex head screws to loosen the steering wheel and add the included lowering attachment to lower, or transfer the wheel to the left side (and relocate the wires). Speaking of adjustments, the throttle trigger can be moved to almost any position along with the spring tension adjusted as well (the steering wheel also has spring tension adjustment). All these options mean the Lynx 4S will feel comfortable for almost any user since it is so customizable. One cool feature that you don’t commonly find on other radios is the ability to play your own music if you supply your own micro SD card. The only downside I could find is that the files must be in .WAV format, so you may need to convert your favorite tracks on your computer before loading up the memory card. The radio also has a vibration function which by default is tied to an inactivity warning which is more useful than you would think. Countless times I have found my transmitters completely drained of their batteries, even with an audible warning. After a few minutes the Lynx 4S begins to vibrate to let the user know that no input has been detected and this grabs your attention faster than any beep or sound in my experience. Both Axion receivers (2 and 4) have very small footprints and weigh next to nothing. Cramming them in any vehicle will be no issue whatsoever. All that was left was to bind the receiver to my specific model. This was super easy, just hold the link button on the receiver as the model is powered up and select the appropriate option in the menu. 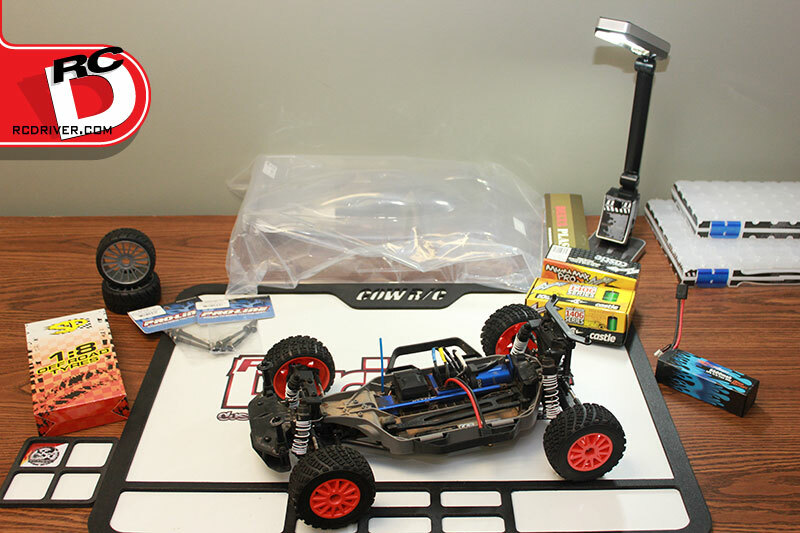 I was using analog servos so I popped the Axion 4 transmitter into a 1/8-scale monster truck and set the frame rate to 14ms and I was ready to go. I didn’t expect there to be any glitches or performance issues and I was 100% correct, even with the high voltages passing through the monster truck, the Hitec Lynx 4S never missed a beat. I could drive the model as far as I was comfortable seeing and even then, full-throttle pulls never caused any glitches whatsoever. It is really neat that the Lynx has an integrated antenna and still has such a great range. Even with the ability to make tons of adjustments I found the stock steering wheel location and spring tension to be spot-on for how I like my radios. I adjusted the throttle trigger slightly towards the back to give me a little more brake control, but the tension was great again. It may not look it, but the Lynx is super comfortable for long periods of use with rubberized grips located where you would be holding the transmitter most often. The throttle trigger is even made of hard rubber material and feels great. After driving around the model for a while, it was time to dive into the menus and see how easy it is to use. I find that a simple radio user interface is super important, because when I am out on the track I don’t want to have to be pulling out a large manual just to see how I can soften my throttle a little. Thankfully the Hitec radio excels in this area, this is apparent the moment you view the options screen with everything neatly laid out and easy to navigate. On the first menu (similar to a tab) you have all of the options related to your specific model. 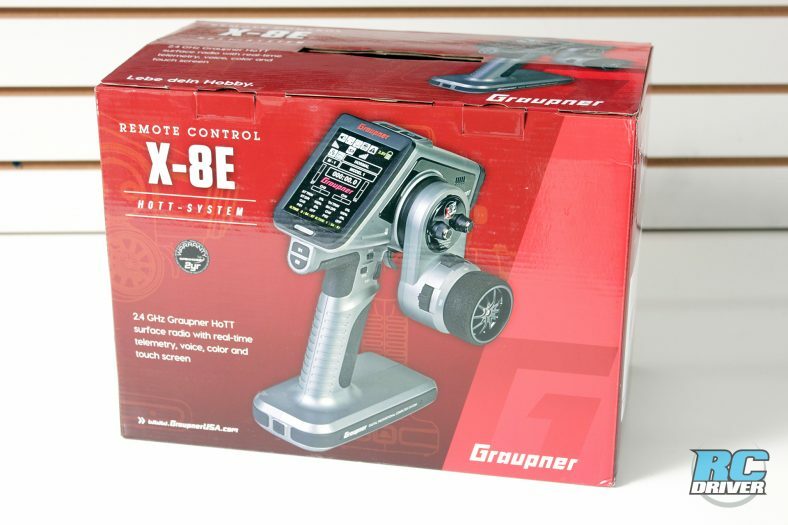 Throttle reversal, EPA, ATL and EXP just to name a few. All you need to navigate the menus are two controls which is easy to adjust with the rotating toggle switch and ESC buttons. Some really cool features are an idle-up setting for nitro motors to help keep them running before they are at operating temps and a throttle boost setting which can be programmed to give a few seconds of extra throttle (for those running really hot electric setups). In this area of the menus you can also find all of the options to help set up the various dials and mixes to utilize the four channels the Lynx has to offer. There are three dials and a toggle button to help you customize how the transmitter works. 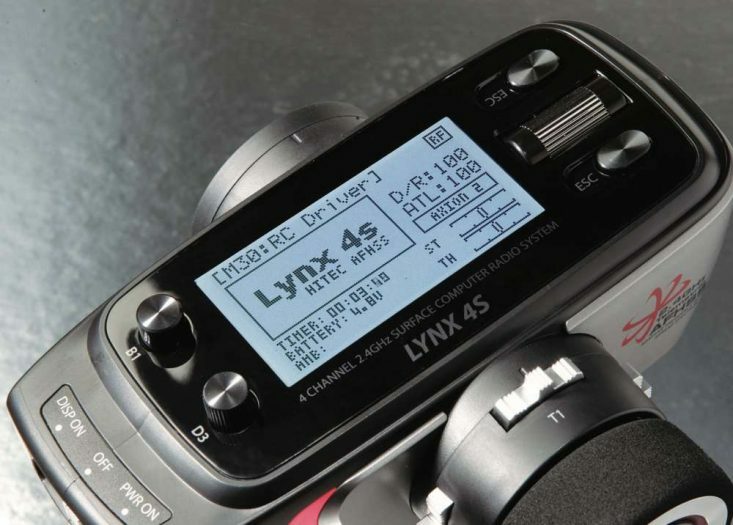 The rest of the menus offer ways to modify how the Lynx 4S behaves for every model and everything is customizable from the color of the LED’s right down to the battery types being use on the transmitter. 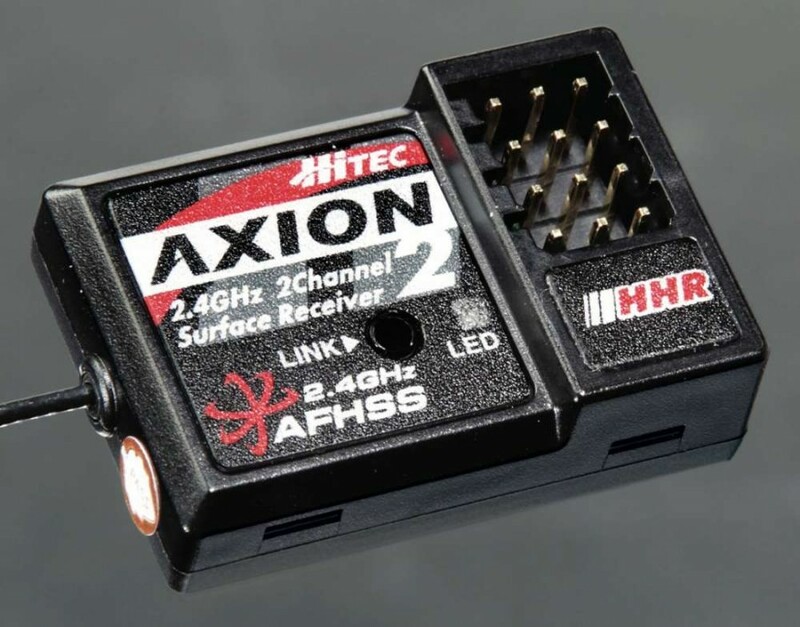 Hitec offers two receivers, the Proton 4 for use with Hitec’s telemetry and the Axion 2 shown here that features Hitec’s impressive High Response rate. Speaking of tunes, under the rub- ber end cover you’ll find the headphone jack and PC Link port. 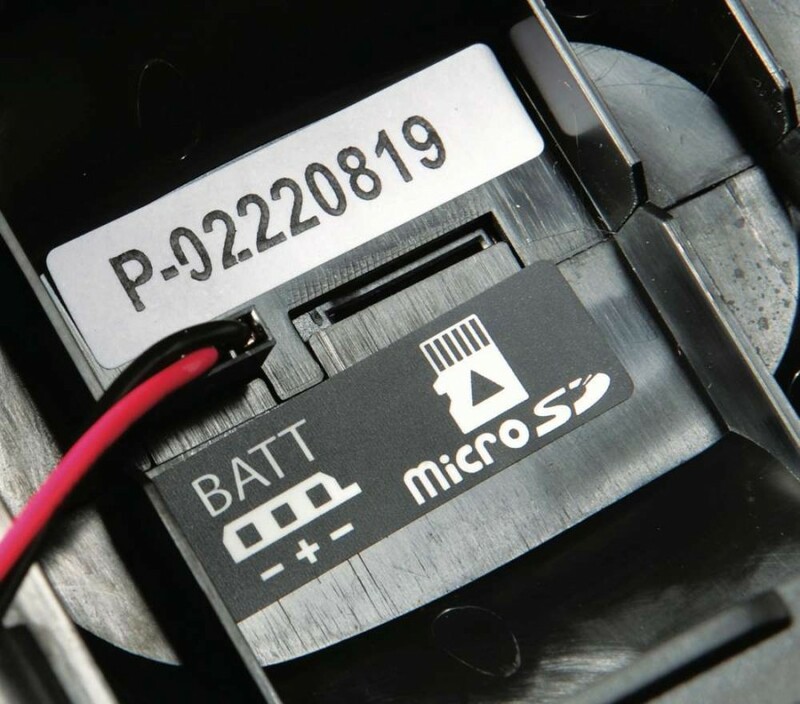 Under the included NiMh battery you’ll find the Micro SD card slot for when you plug in your tunes. 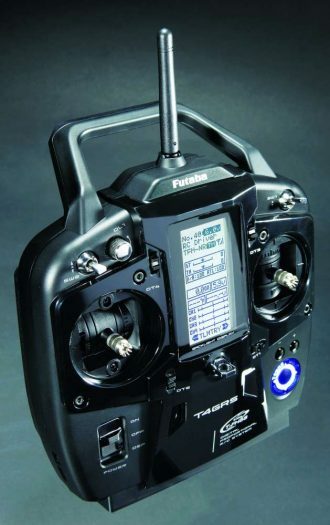 Hitec is back in the game with their newest Lynx 4S transmitter. This radio offers more than other similarly priced models and has tons of cool features you will find in the 4S. 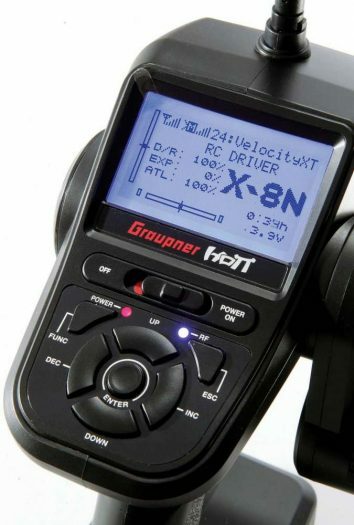 With 30 model memory, this makes the perfect all around radio capable of making your crawlers more enjoyable to use right down to full out competitive racing. Not only that, it makes the perfect first computer radio because it is so easy to use and will not need to be upgraded any time soon.